TiVo adds more music, continues to expand its "television services"
TiVo was once that unique brand of digital video recorder that allowed people to capture television programming to an internal hard disk for later “time-shifted” viewing. Now that there are generic DVRs everywhere, TiVo has been working hard to differentiate its set-top box services from the competition. TiVo this week announced the availability of two “television services” for its popular DVRs — the music-only cable channels from Music Choice and the use of Photobucket and Google’s Picasa Web Albums as a way for people to view and share photos on the TV. While neither will change the face of television as we know it — like the original TiVo did — or add “television services” that we can’t live without, TiVo is at least working to separate its set-top box and digital offerings from those of the generic cable and teleco companies. This year TiVo has expanded its broadband offerings with Amazon Unbox, Rhapsody, and many more through its TivoCast partners. “Be it music, movies or memories, our broadband strategy continues to focus on delivering consumers what they want, when they want it,”said Tara Maitra, TiVo’s VP and GM of Content Services (TiVo release). Music Choice will deliver its catalog of several thousand music videos and original programming through the TiVoCast service. It’s a service that Maitra says will be “extremely popular” among the TiVo audience. I always thought those music-only cable channels were bland, boring, and I could never remember where to find them. But they did come in handy if background music was needed. 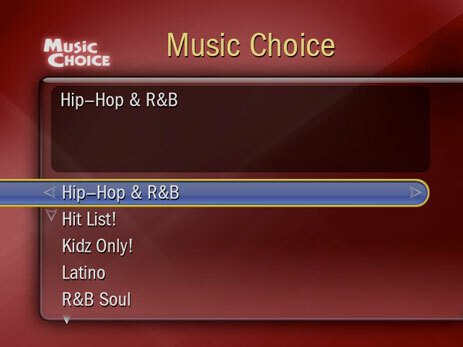 With Music Choice, TiVo subscribers can use the pleasant TiVo interface to browse through rock, pop, hip-hop, R&B, country, Latino, and kids’ videos, original content, and daily entertainment news clips. 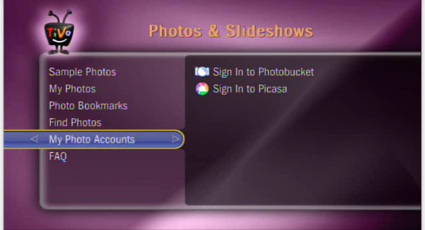 “Personal media sharing is clearly moving beyond the desktop,” said Alex Welch, Photobucket president. And TiVo — the new TiVo — wants to be the deliverer of choice. Forget the usual PR schtick — what is TiVo really doing? Just stopped by to visit and got the crunch on your stuff in here – bravo!